You likely want to monitor the temperature of your wort as it moves from the chiller to the fermenter, and now you can do just that with this In-Line Thermometer. 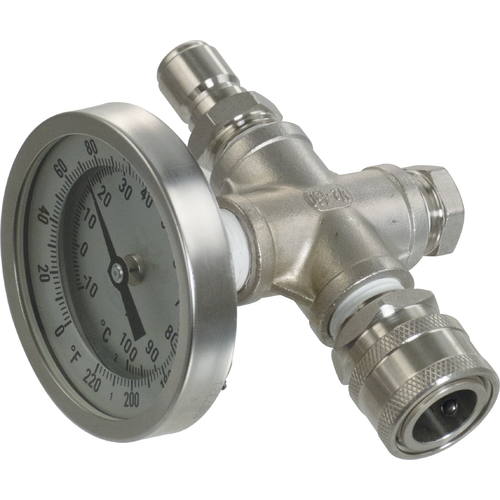 This high quality thermometer features stainless steel quick disconnects for easy installation in line with the rest of your brewing system, and many users install it on the “out” side of their convoluted heat exchangers and counterflow chillers. As the wort runs through the body of the in-line thermometer it runs across the 2-inch thermometer probe, giving an instant and incredibly accurate reading of its exact temperature. Ryan Barto, our Fulfillment Operations Manager and also the thermometer’s inventor, says that this handy device will help you to keep better control of your mash temperatures, and makes it easier to transfer your wort to your conical through the counterflow chiller. I want to monitor my wort temp going into fermentor. Don't want to over cool. To chill inline for brewing Gose. Saw a video of someone using same setup. To monitor the temperature leaving the counterflow chiller. Awesome for maintaining temperature control for inline systems. This is a nice addition to have between the kettle and fermenter. I like knowing how much I need to throttle the input water to the plate chiller to get the temps I want going into the fermenter. I also like not having to worry about the wort temps damaging it. Careful. This thing is a trub collector. Careful with this guy. You will neef to disassemble this regularly to get rid of the hops that get stuck. If your not prepared to do this then just stick to a regalar thermometer. This is great to monitor your temo as you pour into the fermenter. We've got 2 of them! I watch the wort flow out temp of our MoreBeer 26 gallon Boil Kettle and then the flow back in as it leaves our plate chiller headed for the kettle again. They both are vital tools to our wort chilling process and making sure we are cooling down to temp in a speedy and timely manner. Plus upgrading to all quick disconnect is the Best! Want to know your mash temp to the T w your RIMS system?? This is the way to go then. I attached it directly onto the output valve of my mash tun. Not sure if it's reading accurate. Now I know the exact temp of the wort as it exits the chiller. For most batches I've been able to set the speed and forget it with this setup. Why did I wait ! I just built a Brutus 10 clone and was having difficulty with getting an accurate mash temp during my recirculating of the mash. I was getting inaccurate temps from the thermometer off the mash kettle. I purchased the Inline thermometer and attached it between the pump and sparge arm. Works great. Also use it during the sparge to get accurate temps from the Hot liquor tank. Its a must have. I was guessing at my temperatures in the past. Now I am able to hit the fermenter at the exact temperature that I am shooting for. The recommended cleaning regiment is a bit tedious, but I think it is worth it. 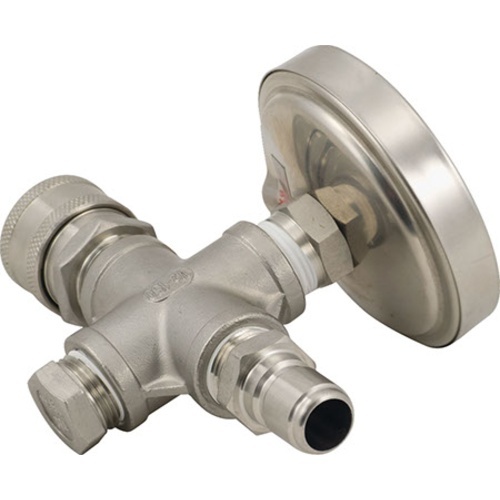 I have this connected to my 'Chillus Convolutus Counterflow Chiller' and adjust the flow during the summer months when it takes a little longer to chill the wort. I was holding a thermometer in the output stream from my chirron plate chiller to measure the wort temperature and realized it was time for something better. Wort can be pushed through from either diection. Remember to order 1/2 " tubing,a clamp and a 1/2" barbed QD to allow wort to easily enter your fermenter from the output side of the Barto. Cleaning and sanitizing is easy. The dial thermometer is easy to read and responds quickly to temperature change.